Commercial Loan Corporation is a California Lender specializing in Loans to Irrevocable Trusts. We lend the cash you need to distribute a trust and receive your proposition 58 exclusion from property tax reassessment on an inherited home. When it comes time to distribute an irrevocable trust and funds are needed to make an equal distribution, you will find that most lenders are unwilling to lend on real estate that is held in a trust. This becomes extremely problematic if you plan on filing for a California Proposition 58 exclusion from property tax reassessment on real estate being inherited from a parent. One of the requirements to qualify for an exclusion from property reassessment is for the trust to make an equal distribution of the trust assets to all child beneficiaries. Often times that is not possible to do if one of the trust assets is an expensive piece of California real estate. In the situation where a home is creating an unequal trust distribution, a mortgage or third party loan must be taken out to infuse the trust with enough cash so that the equal distribution can be made. That way one child receives the encumbered property while others receive cash and or other assets, equalizing the distribution of the trust. The state does not allow for the acquiring beneficiary to use their own funds to equalize the distribution. Doing so would create a sibling to sibling buyout and make the beneficiary ineligible for an exclusion from reassessment. That is why a third party loan is required. The problem is that most California lenders will require that the property be removed from the trust in order to lend on the home. Unfortunately, once that is done, you have jeopardized your ability to qualify for the Prop 58 property tax reassessment exclusion since the assets of the trust were distributed unevenly at that point. The solution is to have a mortgage placed on the home while the property is still held in the irrevocable trust. That is where Commercial Loan Corporation comes in. We are a leading California lender of mortgages for homes held in an irrevocable trust. What makes us unique is that we lend to the trust as opposed to a beneficiary; allowing the beneficiary to qualify for the California Proposition 58 exclusion from property tax reassessment on a home inherited from a parent. If you, a client, or someone that you know is in need of a loan to a trust, please have them call us at 877-464-1066. We specialize in the process and can answer any questions that they may have. We can also provide them with a free loan benefit proposal. The proposal compares the cost of the trust loan to the benefits received from a Prop 58 parent to child property transfer, ensuring that the trust loan is beneficial. We can also determine how much additional funds you would receive by maximizing your trust distribution. On average we help clients distribute an additional $42,000 to beneficiaries my maximizing their trust distribution. 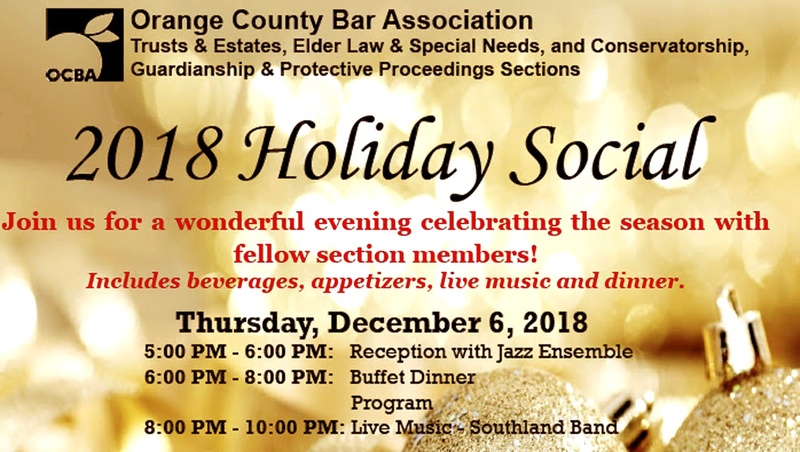 Please join Commercial Loan Corporation at the 2018 Orange County Bar Trust & Estate Holiday Social. The event is being held on December 6th, 2018 at the Ocean Institute in Dana Point. Both Mike Riggs and Tanis Alonso will be attending the event from the Commercial Loan Corporation Trust & Estate Lending Department. They can answer any questions that you may have on our loans to trusts and estates. We are experts on 3rd party financing to trusts and estates to help our clients preserve a parents property tax base on an inherited home. Third Party Trusts & Estate Loans To Keep A Parents Property Tax Base On An Inherited Home. If you will not be able to attend the Trust & Estate Holiday Social, but would like more information on our trust loans, estate loans or a loan to a home in probate; please call us at 877-464-1066. We can give you a free estimate on how much you might be able to save by preserving the property tax base on an inherited home. We assist both clients and attorneys with matters regarding California Proposition 58. For additional information on our trust loan programs or to apply for a trust or estate loan online, please visit this trust and estate loan page on our website. Please visit our table at the USC Gould School of Law 44th Annual Trust & Estate Conference on 11/16/2018. Mike Riggs & Tanis Alonso will be available to answer all of your questions on lending to a property held in a trust and how to preserve a property tax base on an inherited property in California. We will be hosting a table at the event from 7:AM to 3:PM and look forward to seeing your there. Exhibit hours are from 7:00 a.m. to 3:00 p.m. in the California Ballroom Foyer. The Ballroom Foyer is located on the 2nd floor. Exhibit tables are located in close proximity to the general sessions. If you will not be able to attend the event, but have questions on loans to trusts and properties in a probate estate, please call us at 877-464-1066. We can assist you in understanding how you or a client can benefit from California Proposition 58 by transferring a parents low property tax rate to a child inheriting a home. Commercial Loan Corporation specializes in providing loans to property held in a trusts, including irrevocable trusts so that this can be accomplished. Our trust loans are Prop 58 compliant and allow for an equal distribution of the trust to be made using third party funds. 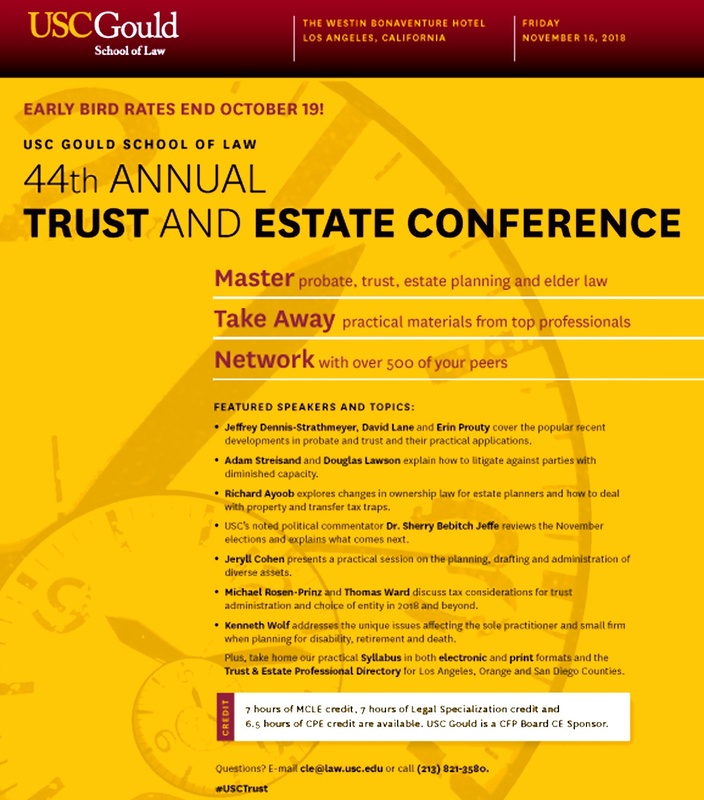 Click here for a link to use USC Gould School of Law Trust & Estate Flyer for details on how to attending and visit our booth on Loans to Trusts in California. California Loans to Trusts, Estates and On Homes Being Inherited From A Parent. Commercial Loan Corporation is a California direct lender for real estate and homes in trusts, irrevocable trusts, estates, probate and on homes being inherited from a deceased parent. Trust and Estate lending is our specialty. We offer custom loan programs to meet your specific needs. Our specialized loans provide our clients with the cash needed to allow each beneficiary, heir or sibling to receive an equal portion of the assets from a trust or inheritance. This allows one person to inherit real estate while others receive cash or cash and other assets. Our trust loans are affordable and usually cost far less than the fees associated with selling a property saving money for everyone involved. We are a direct lender and can close your loan in as little as 7 days. This allows beneficiaries and heirs to receive their proceeds much faster than if a home is to be sold. Often times it is our clients desire to retain a parents low California Proposition 13 Property Tax Base on the home being inherited. Our loan provides the funds necessary for an equal distribution to be made and to accomplish this. On Average we are able to save our clients over $6,000 a year in property tax payments by keeping a parents low property tax base. Most lenders are unwilling to lend to a trust or do not have the knowledge or capability to provide financing to irrevocable trusts, estates, probate or on a property being inherited from a parent. 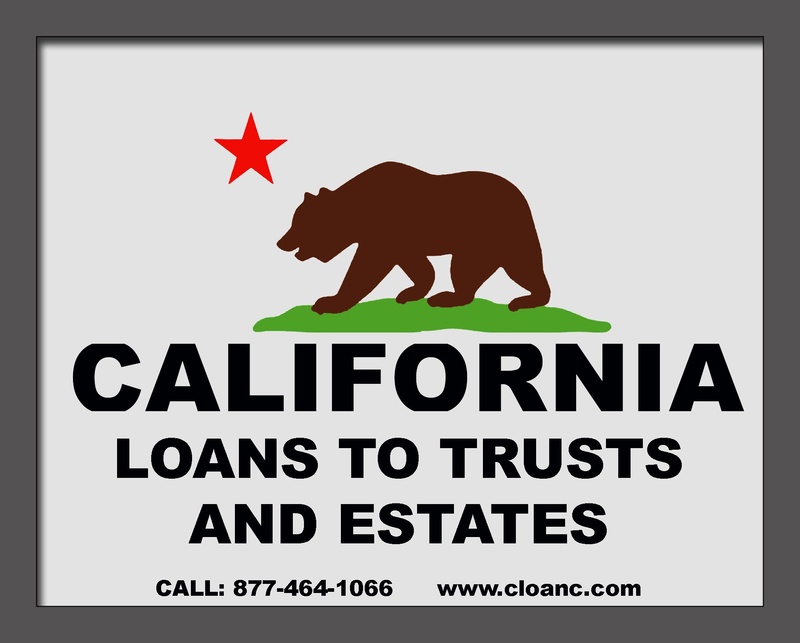 We are a California lender that specializes in loans to trust and loans to estates. Our loans are California Proposition 58 compliant and we can help walk you or your attorney through the process of avoiding the reassessment or an inherited home. We have partnered with a California Property Tax Consultant with over 20 years of experience in the California Property Tax Assessors Office. We can help simplify what is typically a complicated process and help you avoid property tax reassessment on a home being inherited from a parent. Commercial Loan Corporation is a California Private Money Lender that specializes in loans to irrevocable trusts. Due to the complexity and risks associated with lending to trusts, most lenders will not provide this type of finance. 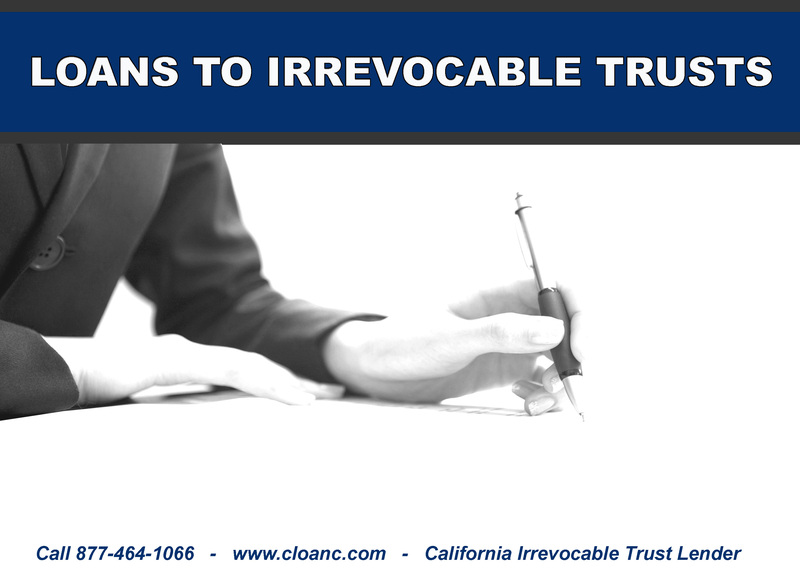 Loans to irrevocable trusts is our primary business focus. If you are a trust administrator and require a trust loan to provide the cash needed for an equal trust distribution, please call us. Our specialized irrevocable trust loans can help provide the liquidity needed to allow for an equal distribution. Our loans can help a beneficiary who is inheriting real estate qualify for a California Prop 58 exclusion from property tax reassessment. Taking advantage of the Proposition 58 property tax reassessment exclusion can save potentially several thousands of dollars a year in property taxes. If you are interested in receiving a loan for an irrevocable trust or have questions on the trust loan process, please call us at 877-464-1066. We can help you determine if a trust loan is right for your situation and if you may qualify for Proposition 58. 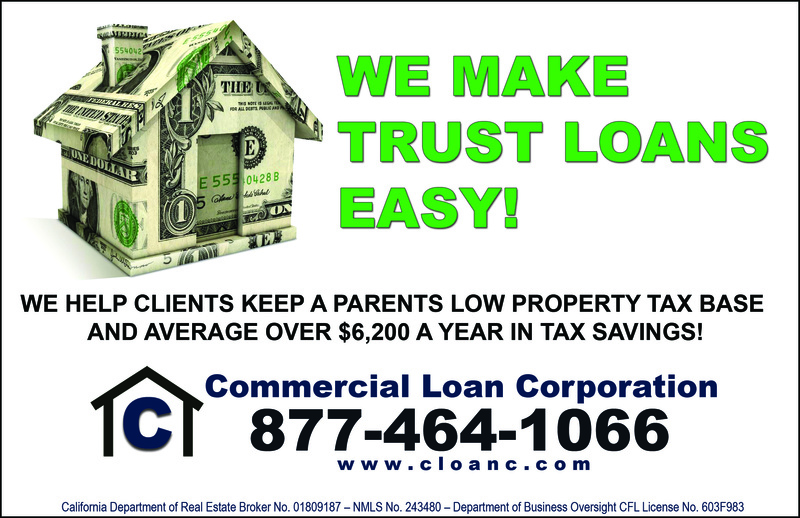 CALL US AT 877-464-1066 or Apply for a trust loan online here.